The head of the Moscow Helsinki Group, Lyudmila Alexeyeva, 88, has been awarded the international Vaclav Havel Human Rights Prize. 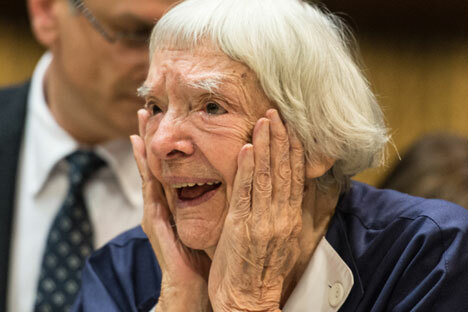 Prominent Russian human rights activist Lyudmila Alexeyeva, the founder and head of the Moscow Helsinki Group and a member of the presidential council for civil society and human rights, has been awarded this year’s Vaclav Havel Human Rights Prize. The veteran human rights campaigner was presented with the award by Parliamentary Assembly of the Council of Europe (PACE) President Anne Brasseur on Sept. 28, at the opening of the PACE fall session in Strasbourg. Alongside Alexeyeva, this year’s shortlist featured The Youth Initiative for Human Rights and the Women for Afghan Women movement. The amount of the prize is 60,000 euros ($67,500). “I extend my heart-felt congratulations to Lyudmila Mikhaylovna [Alexeyeva] and believe that she is exactly the person who deserves this prize,” Russian human rights ombudsman Ella Pamfilova told RBTH, commenting on the news. She went on to compliment Alexeyeva on the consistency with which she has carried out her human rights work over the years. “She never seeks confrontation but looks for mutually acceptable solutions, which is very important. She never looks back and never tries to please anyone. I would like to wish to her to continue to defend human rights with the same clarity of mind and energy as she does,” said Pamfilova. The Vaclav Havel Prize was set up three years ago by the Vaclav Havel Library, the Charter 77 Foundation and PACE. Lyudmila Alexeyeva was born in 1927 in Yevpatoria, USSR. She became a rights activist by speaking out against the trials of political prisoners in 1966. For this she was fired from work and excluded from the Communist Party. However, she continued distributing underground publications on human rights. In 1976 she co-founded the Moscow Helsinki Group, but in 1977 emigrated to the U.S. and returned to Russia only in 1993. She is the author of more than one hundred articles on human rights, the book The History of Dissent in the USSR and her memoirs, The Thaw Generation. She has received numerous awards, among which are the French Legion of Honor (2007), the Order of Merit of the Federal Republic of Germany (2009) and the Andrei Sakharov Prize (2009).